Yesterday afternoon it cleared fantastically. In the evening, I targetted the KH-12 Keyhole USA 129 (96-072A), which I also observed on the 11th and 14th under much more challenging conditions. USA 129 had some confusion in store: at the moment it appeared from behind the roof on its ascending trajectory, not one but two bright objects appeared, side by side and moving more or less parallel. One of the objects (the westernmost one) moved slightly faster than the other. It was a Chinese Long March rocket booster, CZ-2C r/b (09-061B) used to launch the SJ-11-01 experimental satellite. USA 129 itself next slowly flared to mag. +0.5 at about 19:35:05 UTC. 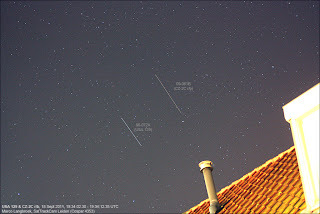 The first image showed, besides USA 129 and CZ-2C r/b, yet a third, very faint trail. It didn't match any known object. After some enhancing and looking at it in detail, I think it is actually a meteor, not a satellite. As my attention was to the bright and unexpected USA 129/CZ-2C r/b chance duo, I did not see the object visually. In the early morning, UARS, now only days from re-entry, would make a pass emerging from earth shadow at 20 degrees altitude under Orion near 3:50 UTC (5:50 am local time). This was probably my last chance to see it before re-entry. When I woke up and checked the sky it was clear apart from a field of clouds in the northwest. Grabbing my gear, patches of clouds unfortunately moved in south as well. Short story: patch of clouds right under Orion right at the moment UARS would pass....so UARS not seen, alas. The expected decay of UARS is moving more and more forward in time, and is now set for the second half of September 23rd.